The Redbirds played from a deficit all tournament, falling behind in four of the five games but battled back and found ways to win. Ralph Rodriguez was an offensive force going 12 for 16 in the tournament with a pivotal 3-run double in the semifinal game versus Utah. 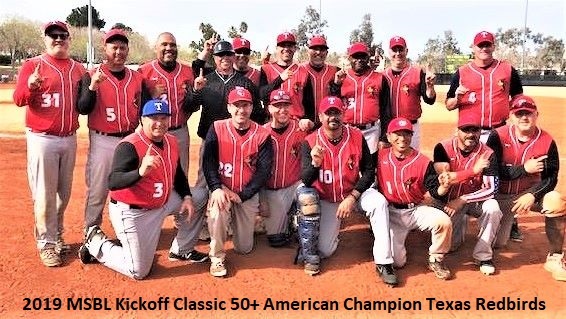 Just as dominating on the mound was Fernando Gonzalez, who went 2-0 on the hill with a complete game victory in the Championship game facing off against one of the best MSBL pitchers in Robert Calvert and a tough Diamond Dream Mustang team. Most of our team has either played with Calvert or against him and we knew we would have our hands full in the finals. Gonzalez was up to the challenge and pitched through some defensive adversity to earn the complete game victory. Bill Steele drew a bases loaded walk in the bottom of the ninth for a walk off Championship, 9 to 8. 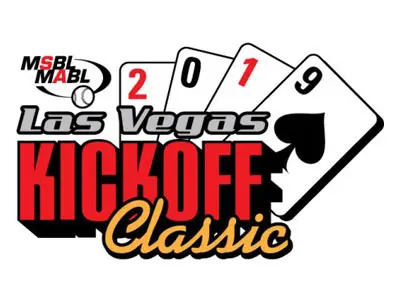 Other notable tournament standouts were Buck McGilvary hitting over .500 at the plate while throwing a complete game victory in the Semi Final game against the Utah Braves. Ernie Lujan played outstanding shortstop while hitting over .400 with seven runs scored. Chris Hux scored three runs in the Championship game, while hitting over .400. Izzy Salaberrios pitched great in two games and had several hits throughout the pool round. Lalo Diaz was solid in center field and Scott Stone was a valuable utility player at third and behind the plate. Jonny Gutierrez and Robby Staples came through with some key kits. Mike Kalfopoulos played error free ball at first base and had several hits. All 18 men on the roster contributed to this Championship and it’s tough not to mention them all. We had a team full of grinders who love to compete. I truly appreciate everyone’s efforts.